Houghton Mifflin Harcourt, 9780544534315, 240pp. In a city with so many great sandwich joints, Num Pang Sandwich Shop is a standout, receiving high praise from numerous sources including Bon Appétit and Zagat. First opened in 2009 by Ratha Chaupoly and Ben Daitz, the restaurant introduced New York City to Cambodian-inspired sandwiches and sides. Today, there are six locations in the city with more in the works. 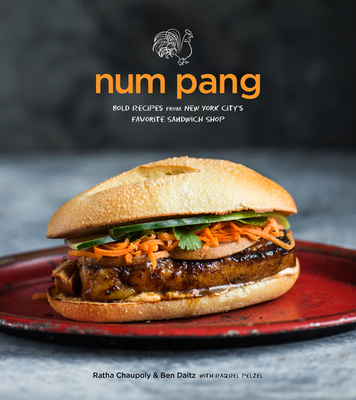 Num Pang sandwiches are similar to Vietnamese banh mi, but what makes them so special is the inventive fillings, ranging from Glazed Five-Spice Pork Belly to Seared Coconut Tiger Shrimp to Hoisin Meatballs. The book provides recipes for all the fan favorites as well as ones for condiments like Pickled Five-Spice Asian Pears, sides like the Sambal Chili–Glazed Chicken Wings, soups and stews like Curried Red Lentil Soup, salads like Green Papaya Salad, and drinks like Cambodian Iced Coffee. With touches of graffiti art inspired by the chain’s signature urban, hip-hop style, Num Pang looks just as bold as the mouthwatering recipes taste. In 2009, RATHA CHAUPOLY and BEN DAITZ opened up the Num Pang Sandwich shop, which sells Asian sandwiches and sides that combine flavors from Ratha's childhood in Cambodia with Ben's culinary technique. They now have six locations throughout the city.